Troy (Greek: Τροία, Troia, also Ίλιον, Ilion; Turkish Truva, Troya; Latin: Troia is preferred, but Ilium is a more poetic term) is a legendary city and center of the Trojan War, as described in the Iliad, one of the two epic poems attributed to Homer. The archaeological site at Hisarlik in Turkey, identified by Heinrich Schliemann as historical Troy, was added to the UNESCO World Heritage list in 1998. This site, which represents much of the cultural history of the Western world, is an inspiration to those who yearn to believe that the legendary accounts in Greek mythology have a basis in reality. Even if every detail is not true, the ideals and morals expressed in these tales are foundational to western culture, and the artifacts and remains that have been unearthed at the site provide an illuminating experience of life in ancient times. Thus the finding and preservation of this site is of great value to humankind. According to mythology, the Trojans were the ancient citizens of the city of Troy in the Troad region of Anatolia (now Turkey). 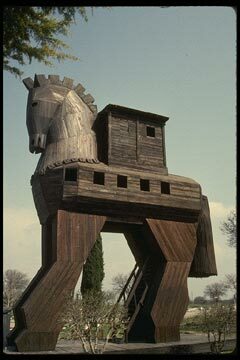 Although part of Asia, Troy is presented in the legend as part of the Greek culture of City states. Troy was known for its riches gained from port trade with east and west, fancy clothes, iron production, and massive defensive walls. The Trojan royal family was started by the Pleiad Electra and Zeus, the parents of Dardanus. Dardanus, who according to Greek myth was originally from Arcadia but according to Roman myth was originally from Italy, crossed over to Asia Minor from the island of Samothrace, where he met King Teucer. Teucer was himself also a colonizer from Attica, and treated Dardanus with respect. Eventually, Dardanus married Teucer's daughters, and founded Dardania (later ruled by Aeneas). Upon Dardanus' death, the Kingdom was passed to his grandson Tros, who called the people Trojans and the land Troad, after himself. Ilus, son of Tros, founded the city of Ilium (Troy) that he called after himself. Zeus gave Ilus the Palladium. Poseidon and Apollo built the walls and fortifications around Troy for Laomedon, son of Ilus the younger. When Laomedon refused to pay, Poseidon flooded the land and demanded the sacrifice of Hesione to a sea monster. Pestilence came and the sea monster snatched away the people of the plain. One generation before the Trojan War, Heracles captured Troy and killed Laomedon and his sons, except for young Priam. Priam later became king. During his reign, the Mycenaean Greeks invaded and captured Troy in the Trojan War (traditionally dated from 1193–1183 B.C.E.). The Maxyans were a west Libyan tribe who said that they were descended from the men of Troy, according to Herodotus. The Trojan ships transformed into naiads, who rejoiced to see the wreckage of Odysseus' ship. Trojan rule in Asia Minor was replaced by the Herakleid dynasty in Sardis, which ruled for 505 years until the time of Candaules. The Ionians, Cimmerians, Phrygians, Milesians of Sinope, and Lydians moved into Asia Minor. The Persians invaded in 546 B.C.E. Some famous Trojans are: Dardanus (founder of Troy), Laomedon, Ganymede, Priam and his children Paris, Hector, Teucer, Aesacus, Oenone, Tithonus, Antigone, Memnon, Corythus, Aeneas, Brutus, and Elymus. Kapys, Boukolion, and Aisakos were Trojan princes who had naiad wives. Some of the Trojan allies were the Lycians and the Amazons. The Aisepid nymphs were the naiads of the Trojan River Aisepos. Pegsis was the naiad of the River Granicus near Troy. "Helen of Troy" was born not in Troy but Sparta. Mount Ida in Asia Minor is where Ganymede was abducted by Zeus, where Anchises was seduced by Aphrodite, where Aphrodite gave birth to Aeneas, where Paris lived as a shepherd, where the nymphs lived, where the "Judgement of Paris" took place, where the Greek gods watched the Trojan War, where Hera distracted Zeus with her seductions long enough to permit the Achaeans, aided by Poseidon, to hold the Trojans off their ships, and where Aeneas and his followers rested and waited until the Greeks set out for Greece. The altar of Panomphaean (source of all oracles) was dedicated to Jupiter the Thunderer (Tonatus) near Troy. Buthrotos (or Buthrotum) was a city in Epirus where Helenus, the Trojan seer, built a replica of Troy. Aeneas landed there and Helenus foretold his future. Such was the fame of the Trojan story in Roman and medieval times that it was built upon to provide a starting point for various legends of national origin. The most famous is undoubtedly that promulgated by Virgil in the Aeneid, tracing the ancestry of the founders of Rome, more specifically the Julio-Claudian dynasty, to the Trojan prince Aeneas. Similarly Geoffrey of Monmouth traces the legendary Kings of the Britons to a supposed descendant of Aeneas named Brutus. In the Iliad, the Achaeans set up their camp near the mouth of the river Scamander (presumably modern Karamenderes), where they had beached their ships. 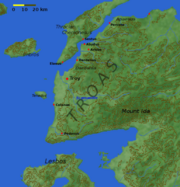 The city of Troy itself stood on a hill, across the plain of Scamander, where the battles of the Trojan War took place. The site of the ancient city today is some 15 kilometers from the coast, but the ancient mouths of alleged Scamander, some 3,000 years ago, were some 5 kilometers further inland, pouring into a bay that has since been filled with alluvial material. Geological findings have revealed what the Trojan coastline would look like, indicating that Homeric geography of Troy is accurate. Silver tetradrachm from Troy during the Hellenistic period, 188–160 B.C.E. Head of Athena in Attic helmet. Reverse female figure and owl with inscription: ΑΘΗΝΑΣ ΙΛΙΑΔΟΣ, ΚΛΕΩΝΟΣ ΙΛΙΟΥ. Besides the Iliad, there are references to Troy in the other major work attributed to Homer, the Odyssey, as well as in other ancient Greek literature. The Homeric legend of Troy was elaborated by the Roman poet Virgil in his work the Aeneid. The Greeks and Romans took for a fact the historicity of the Trojan War, and in the identity of Homeric Troy with the site in Anatolia. Alexander the Great, for example, visited the site in 334 B.C.E. and made sacrifices at the alleged tombs of the Homeric heroes Achilles and Patroclus. Ancient Greek historians placed the Trojan War variously in the twelfth, thirteenth, or fourteenth century B.C.E. : Eratosthenes to 1184 B.C.E., Herodotus to 1250 B.C.E., Douris to 1334 B.C.E.. In November 2001, geologists John C. Kraft from the University of Delaware and John V. Luce from Trinity College, Dublin presented the results of investigations into the geology of the region that had started in 1977. The geologists compared the present geology with the landscapes and coastal features described in the Iliad and other classical sources, notably Strabo's Geographia. Their conclusion was that there is regularly a consistency between the location of Troy as identified by Schliemann (and other locations, such as the Greek camp), the geological evidence, and descriptions of the topology and accounts of the battle in the Iliad. A small minority of contemporary writers argue that Homeric Troy was not in Anatolia, but located elsewhere: England, Croatia, and Scandinavia have been proposed. However, these theories have not been accepted by mainstream scholars. Kenneth J. Dillon has argued that the Trojans were originally a steppe people related to the Magyars. After attacking and destroying the Hittite Empire, they came to control the Straits. During the Trojan War, the Greeks used a naval blockade to prevent Trojans on the European shore and on Lemnos from coming to the aid of Troy. Once Troy fell, the Trojans on the European shore fled northward and ended up as the Etruscans in Italy. The events described in Homer's Iliad, even if based on historical events that preceded its composition by some 450 years, will never be completely identifiable with historical or archaeological facts, even if there was a Bronze Age city on the site now called Troy, and even if that city was destroyed by fire or war at about the same time as the time postulated for the Trojan War. No text or artifact has been found on site itself which clearly identifies the Bronze Age site. This is probably due to the planification of the former hillfort during the construction of Hellenistic Ilium (Troy IX), destroying the parts that most likely contained the city archives. A single seal of a Luwian scribe has been found in one of the houses, proving the presence of written correspondence in the city, but not a single text. Scientists' understanding of the geography of the Hittite Empire makes it very likely that the site corresponds to the city of Wilusa. But even if that is accepted, it is of course no positive proof of identity with Homeric (W)ilion. The name Wilion or Troia does not appear in any of the Greek written records from the Mycenean sites. The Mycenaean Greeks of the thirteenth century B.C.E. 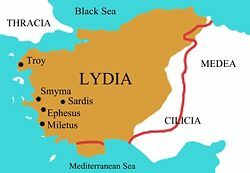 had colonized the Greek mainland and Crete, and were only beginning to make forays into Anatolia, establishing a bridgehead in Miletus (Millawanda). Historical Wilusa was one of the Arzawa lands, in loose alliance with the Hittite Empire, and written reference to the city is therefore to be expected in Hittite correspondence rather than in Mycenaean palace archives. The dispute over the historical accuracy of the Iliad has been very heated at times. The more scientists discover about Bronze Age history, the clearer it becomes that it is not a yes-or-no question of verification, but one of educated assessment of how much historical knowledge is present in Homer. The story of the Iliad is not an account of the war, but a tale of the psychology, wrath, vengeance, and death of individual heroes that assumes common knowledge of the Trojan War to create a backdrop. No scholars assume that the individual events in the tale (many of which centrally involve divine intervention) are historical fact; on the other hand, no scholars claim that the scenery is entirely devoid of memories of Mycenaean times: It is rather a subjective question of whether the factual content is rather more or rather less than one would have expected. The ostensible historicity of Homer's Troy faces the same hurdles as with Plato's Atlantis. In both cases, an ancient writer's story is now seen by some to be true, by others to be mythology or fiction. It may be possible to establish connections between either story and real places and events, but these connections may be subject to selection bias. Some archaeologists and historians maintain that none of the events in Homer's writings are historical. Others accept that there may be a foundation of historical events in the Homeric stories, but say that in the absence of independent evidence it is not possible to separate fact from myth in the stories. In recent years scholars have suggested that the Iliad and the Odyssey represented a synthesis of many old Greek stories of various Bronze Age sieges and expeditions, fused together in the Greek memory during the "dark ages" which followed the fall of the Mycenean civilization. In this view, no historical city of Troy existed anywhere: The name derives from a people called the Troies, who probably lived in central Greece. The identification of the hill at Hisarlik as Troy is, in this view, a late development, following the Greek colonization of Asia Minor in the eighth century B.C.E..
Another view is that Homer was heir to an unbroken tradition of epic poetry reaching back some 500 years into Mycenaean times. In this view, the poem's core could reflect a historical campaign that took place at the eve of the decline of the Mycenaean civilization. Much legendary material would have been added during this time, but in this view it is meaningful to ask for archaeological and textual evidence corresponding to events referred to in the Iliad. Such an historical background gives a credible explanation for the geographical knowledge of Troy (which could, however, also have been obtained in Homer's time by visiting the traditional site of the city) and otherwise unmotivated elements in the poem (in particular the detailed Catalogue of Ships). Linguistically, a few verses of the Iliad suggest great antiquity, because they only fit the meter if projected back into Mycenaean Greek, suggesting a poetic tradition spanning the Greek Dark Ages. Even though Homer was Ionian, the Iliad reflects the geography known to the Mycenaean Greeks, showing detailed knowledge of the mainland but not extending to the Ionian islands or Anatolia, which suggests that the Iliad reproduces an account of events handed down by tradition, to which the author did not add his own geographical knowledge. Today, Troy is the name of an archaeological site, the traditional location of Homeric Troy, Truva, in Hisarlık in Anatolia, close to the seacoast in what is now Çanakkale province in northwest Turkey, southwest of the Dardanelles under Mount Ida. A new city of Ilium was founded on the site during the reign of Roman Emperor Augustus. It flourished until the establishment of Constantinople and declined gradually during Byzantine times. In the 1870s, the German archaeologist Heinrich Schliemann excavated the area. 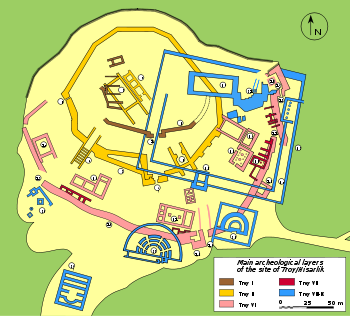 Later excavations revealed several cities built in succession to each other. 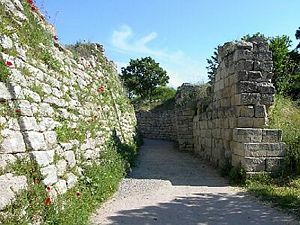 One of the earlier cities (Troy VII) is often identified with Homeric Troy. While such an identity is disputed, the site has been successfully identified with the city called Wilusa in Hittite texts; Ilion (which goes back to earlier Wilion with a digamma) is thought to be the Greek rendition of that name. Troy V: twentieth–eighteenth centuries B.C.E. (Western Anatolian EB 3 [late]). Troy VI: seventeenth–fifteenth centuries B.C.E. Troy VIh: late Bronze Age, fourteenth century B.C.E. Troy VIIa: ca. 1300–1190 B.C.E., most likely candidate for Homeric Troy. Troy VIIb1: twelfth century B.C.E. Troy VIIb2: eleventh century B.C.E. Troy VIIb3: until ca. 950 B.C.E. Troy VIII: around 700 B.C.E. Troy IX: Hellenistic Ilium, first century B.C.E. The archaeological site of Troy was added to the UNESCO World Heritage list in 1998. The first city was founded in the third millennium B.C.E.. During the Bronze Age, the site seems to have been a flourishing mercantile city, since its location allowed for complete control of the Dardanelles, through which every merchant ship from the Aegean Sea heading for the Black Sea had to pass. Troy VI was destroyed around 1300 B.C.E., probably by an earthquake. Only a single arrowhead was found in this layer, and no bodily remains. Map of Troy (VII or VIII) and Other Cities within the Lydian Empire. The archaeological layer known as Troy VIIa, which has been dated on the basis of pottery styles to the mid-to-late thirteenth century B.C.E., is the most often-cited candidate for the Troy of Homer. It appears to have been destroyed by a war, and there are traces of a fire. Until the 1988 excavations, the problem was that Troy VII seemed to be a hill-top fort, and not a city of the size described by Homer, but later identification of parts of the city ramparts suggests a city of considerable size. Partial human remains were found in houses and in the streets, and near the north-western ramparts a human skeleton with skull injuries and a broken jawbone. Three bronze arrowheads were found, two being in the fort and one in the city. However, only small portions of the city have been excavated, and the finds are too scarce to clearly favor destruction by war over a natural disaster. 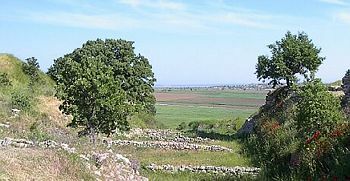 The site remained inhabited following the destruction of Troy VIIa. Troy VIIb dates to a time when Greek influence began to extend to the area (the "Greek Dark Ages"). Troy VIIb1 (ca. 1120 B.C.E.) and Troy VIIb2 (ca. 1020 B.C.E.) appear to have been destroyed by fires. Corresponding dates according to the mythical chronology of Greece as calculated by classical authors place the construction of the walls of Troy by Poseidon, Apollo, and Aeacus at 1282 B.C.E. and the sack of Troy by the Greeks at 1183 B.C.E. Troy VIIb3 was deserted in the mid tenth century B.C.E., and the site remained uninhabited for more than 200 years before a new settlement, Troy VIII, was established around 700 B.C.E. The site was again uninhabited throughout Classical Antiquity, until the foundation of Roman Ilium at the site (Troy IX) in the 20s B.C.E.. The last city on this site, Hellenistic Ilium, was founded by Romans during the reign of the emperor Augustus and was an important trading city until the establishment of Constantinople in the fourth century as the eastern capital of the Roman Empire. In Byzantine times the city declined gradually, and eventually disappeared. With the rise of modern critical history, Troy and the Trojan War were consigned to the realms of legend. In the 1870s (in two campaigns, 1871–1873 and 1878-1879), however, the German archaeologist Heinrich Schliemann excavated a hill, called Hisarlik by the Turks, near the town of Chanak (Çanakkale) in north-western Anatolia. There he discovered the ruins of a series of ancient cities, dating from the Bronze Age to the Roman period. Schliemann declared one of these cities—at first Troy I, later Troy II—to be the city of Troy, and this identification was widely accepted at that time. After Schliemann, the site was further excavated under the direction of Wilhelm Dörpfeld (1893-1894) and later Carl Blegen (1932-1938). These excavations have shown that there were at least nine cities built one on top of each other at this site. In 1988 excavations were resumed by a team of the University of Tübingen and the University of Cincinnati under the direction of Professor Manfred Korfmann. The question of Troy's status in the Bronze Age world has been the subject of a sometimes acerbic debate between Korfmann and the Tübingen historian Frank Kolb in 2001-2002. In August 2003, following a magnetic imaging survey of the fields below the fort, a deep ditch was located and excavated among the ruins of a later Greek and Roman city. Remains found in the ditch were dated to the late Bronze Age, the alleged time of Homeric Troy. It is claimed by Korfmann that the ditch may have once marked the outer defenses of a much larger city than had previously been suspected. Possible evidence of a battle was also found in the form of arrowheads found in layers dated to the early twelfth century B.C.E. Korfmann died on 11 August, 2005, and in the summer of 2006, the excavations continued under the direction of Korfmann's colleague Ernst Pernicka. In the 1920s the Swiss scholar Emil Forrer claimed that place names found in Hittite texts—Wilusa and Taruisa—should be identified with Ilium and Troia respectively. He further noted that the name of Alaksandus, king of Wilusa, mentioned in one of the Hittite texts is quite similar to the name of Prince Alexandros or Paris, of Troy. The Hittite king Mursili II in ca. 1320 B.C.E. wrote a letter to the king of the Ahhiyawa, treating him as an equal and implying that Miletus (Millawanda) was controlled by the Ahhiyawa, and also referring to an earlier "Wilusa episode" involving hostility on the part of the Ahhiyawa. This people has been identified with the Homeric Greeks (Achaeans). These identifications were rejected by many scholars as being improbable or at least unprovable. Trevor Bryce, in 1998, championed them in his book The Kingdom of the Hittites, citing a recovered piece of the so-called Manapa-Tarhunda letter, which refers to the kingdom of Wilusa as beyond the land of the Seha (known in classical times as the Caicus) river, and near the land of Lazpa (Lesbos Island). Recent evidence adds weight to the theory that Wilusa is identical to archaeological Troy. Hittite texts mention a water tunnel at Wilusa, and a water tunnel excavated by Korfmann, previously thought to be Roman, has been dated to around 2600 B.C.E.. The identifications of Wilusa with archaeological Troy and of the Achaeans with the Ahhiyawa remain controversial, but gained enough popularity during the 1990s to be considered a majority opinion. Today there is a Turkish town called Truva in the vicinity of the archaeological site, but this town has grown up recently to service the tourist trade. The archaeological site is officially called Troia by the Turkish government and appears as such on many maps. A large number of tourists visit the site each year, mostly coming from Istanbul by bus or by ferry via Çanakkale, the nearest major town, about 50 km to the north-east. The visitor sees a highly commercialized site, with a large wooden horse built as a playground for children, then shops, and a museum. The archaeological site itself is, as a recent writer said, "a ruin of a ruin," because the site has been frequently excavated, and because Schliemann's archaeological methods were very destructive: In his conviction that the city of Priam would be found in the earliest layers, he demolished many interesting structures from later eras, including all of the house walls from Troy II. Also, for many years the site was unguarded and thoroughly looted. However what remains, particularly if put into context by one of the knowledgeable professional guides to the site, is an illuminating insight into civilizations of the Bronze Age, if not into the legends themselves. ↑ Geografy XIII, I, 36, Strabo, tr. H. L. Jones, Loeb Classical Library. ↑ BBC News, Trojan battlefield reconstructed. Retrieved July 25, 2007. ↑ Geological Society of America, Bronze Age Paleographies at Ancient Troy. Retrieved July 25, 2007. ↑ Iman Wilkens, Where Troy Once Stood (Groningen 2005), p. 68. ↑ Scientia Press, The Trojan Origin of Roman Civilization. Retrieved July 25, 2007. ↑ Universität Tübingen, Universität Tübingen setzt Ausgrabungen in Troia fort. Retrieved July 25, 2007. Easton, D.F., J.D. Hawkins, A.G. Sherratt, E.S. Sherratt. "Troy in Recent Perspective," Anatolian Studies, Issue 52. (2002), pp. 75–109. Shepard, Alan and Stephen D. Powell, eds. Fantasies of Troy: Classical Tales and the Social Imaginary in Medieval and Early Modern Europe. Toronto: Centre for Reformation and Renaissance Studies, 2004. All links retrieved December 18, 2015. This page was last modified on 18 December 2015, at 17:34.